I have received the fantastic plaque and I showed it . . . at our local hamfest. I . . . will display it with pride. Once again, thank you and your organization for the presentation! 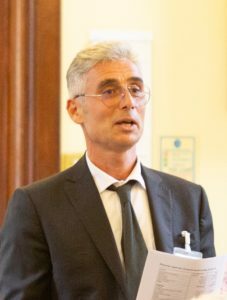 Valery Pakhomov UA3AO is known for his continuing authorship of books and articles promoting CW in the Russian language. Most notable is his Russian language book, Keys Connecting the Continents – A History of the Pioneers of Telegraphy Including 150 Pictures of Keys. 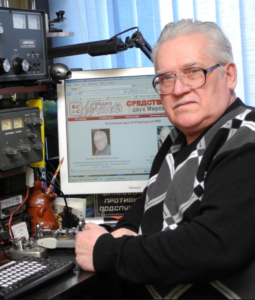 Three of his many articles were awarded diplomas for Best Publications of 2015 by the Russian magazine Radio. Thank you so very much for your congratulations. I couldn’t ever suppose that my popularization of The Art of CW would be appreciated by such friendly way. Straight Key Century Club (SKCC) has been a very active organization promoting CW for 12 years through activities, awards, and helping newcomers. 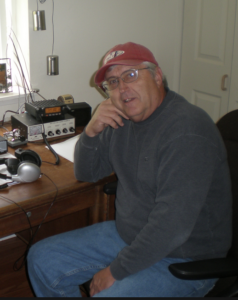 SKCC, with over 18,000 members promotes CW on the air as well as maintaining an excellent program for teaching CW. Their awards program includes 14 different CW awards. SKCC operating activities include two monthly sprint contests, an annual straight key month, a monthly straight key night and a monthly 36 hour Sprintathon contest. 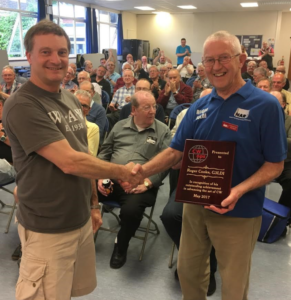 Roger G3LDI, right, receives plaque from G0DWV. I can assure you (the plaque) will take pride of place on my wall. I don’t have that many plaques but this one I do treasure. 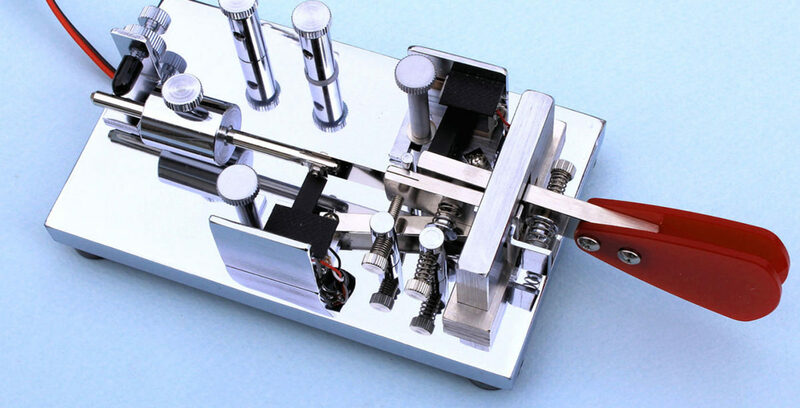 I have always done my best to encourage CW and I am, for my sins, the GB2CW Coordinator for the RSGB, organising Morse transmissions and classes. We do lots of it here in Norwich. You have probably seen my RSGB book, Morse Code for Radio Amateurs. Very pleased and humbled. Many, many thanks again. 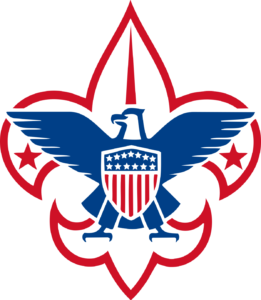 Boy Scouts of America received the award in recognition of its outstanding programs over the years that advance the art of communicating with Morse code. 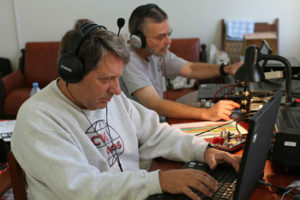 Many radio amateurs can trace their interest in CW to have begun with achievement programs and activities in the Boy Scouts. I have always been and will always be a CW only operator. It is my favorite mode and has given me many years of pleasure and made being on the air a joy. All CW ops should take pride in their skill, no matter what level. It is a skill that must be developed and practiced as much as possible. There seems to be a growth in the number of CW operators and an interest in developing skills. This is only due to the number of active CW clubs and their growth through hard work on the part of the leaders. I am trying to do my part in developing teaching aids and spreading the material at no costs to the students. Thank you for the award. It will hang in the shack to remind me that the work is doing some good. I hope to work many of you on the air in the coming years. Thank you, thank you all. I would first like to say that I am really sorry not to be here with you today. I am really pleased and humbled to find that my intention to share my experience in CW was accepted with such grace by the CW community. It is, then, with great humility and honor that I accept the CWOPS Award for Advancing the Art of CW. The Art of radiotelegraphy, being an art, is part of the things that we are not entitled to buy. And, strange enough, the things that cannot be bought by money are the only ones that become a permanent heritage of ourselves. Rob Brownstein, K6RB for creating, organizing, marketing, and actively participating in the operation of CW Academy. 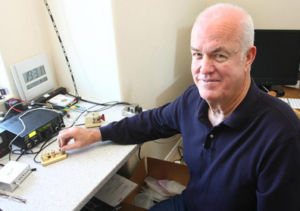 CW Academy trains more than 400 people in Morse Code every year. CW Academy was Rob’s idea, and he has been the driving force behind CW Academy since its creation. By virtue of his superb organizational abilities, he has enlisted the assistance of dozens of advisors and administrators. CW Academy is what it is today because of Rob’s creativity and hard work.